I don’t know about you, but when I’ve got a busy week ahead, Weight Watchers Casserole Recipes are a lifesaver for me! It usually gets my family a good dinner, and then a day or two of lunch leftovers. 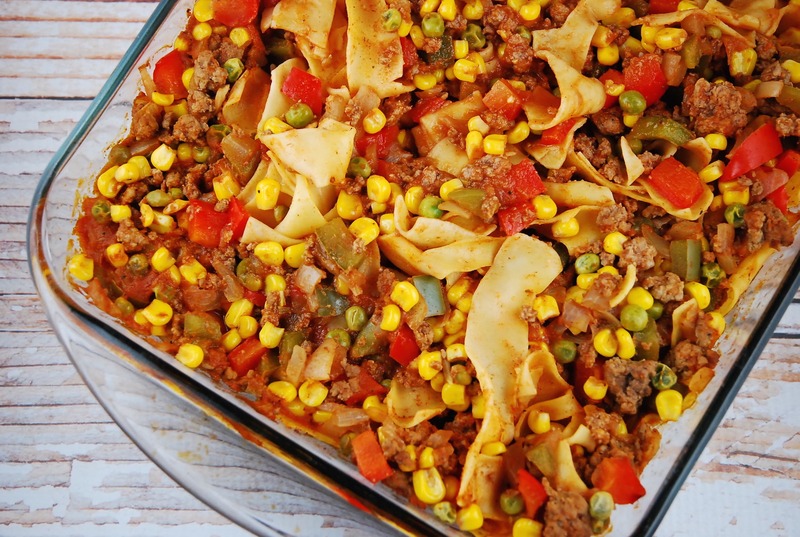 One of my husband’s favorites is this Ground Beef and Noodle Casserole. It’s incredibly hearty and satisfying, is super easy to prepare, and each nicely sized serving is just 8 Points. I really like the flavor of the ground beef in this casserole, but if you want to shave off a Point or two, you can easily use ground turkey instead. But I find that if you use ground sirloin, or extra lean ground beef (96% lean), it comes out to about the same, Points wise. This is a great dinner for a cold winter’s day. Enjoy! This easy Weight Watchers casserole recipe is a great meal that works wonderfully as leftovers the next day. Delicious, hearty and satisfying, it’s a great bargain at just 8 Points per serving. Preheat oven to 375 degrees. Spray a casserole dish with nonfat cooking spray. Set a large, nonstick skillet over medium high heat. Add in the ground beef, peppers, onion and garlic. Cook until meat is browned and is no longer pink inside. Add in corn, peas, tomato sauce, parsley and chili powder. Mix well and then transfer the meat mixture and the noodles to the prepared baking dish. Place in oven, uncovered, and bake for about 25-30 minutes, or until casserole is heated through. We had this for dinner (minus the peas because my gents are fussy) and it was a huge hit! This easy Weight Watchers casserole recipe is a great meal that works wonderfully as leftovers the next day. Delicious, hearty and satisfying, it’s a great bargain at just 6 Points + per serving. Hi, is this recipe 6 points + or 8points +. The top says 8 the bottom says 8. The recipe itself says 6. Hi Barb…I can’t find where you are seeing the recipe stating 6 Points anywhere. The title, the intro text, and the nutritional stats all show 8 Points +. There are 6 servings listed, but I don’t see it saying 6 Points Plus anywhere. The recipe is 8 Points + per serving. It actually says it 6 points + in the little blurb above the ingredient list. Thanks SO much for catching that!! This is what happens when I proofread before coffee…argh! I’ll correct it now…you guys are the best!